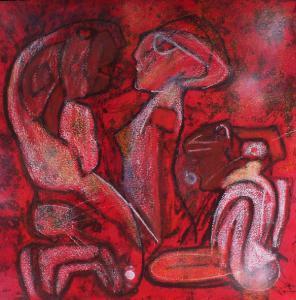 Find artworks, auction results, sale prices and pictures of Roberto Matta at auctions worldwide. 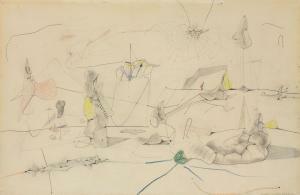 Matta Echauren Roberto Sebastian A.
Matta (Roberto Matta, dit 1911-2002) Paysage signé et daté 'Matta, Paris Sept 39' (en bas à droite) graphite et crayon gras sur papier 32.6 x 50 cm. Exécuté à Paris en septembre 1939 signed and dated 'Matta, Paris Sept 39' (lower right) pencil and wax crayon on paper 12 7/8 x 19 ¾ in. 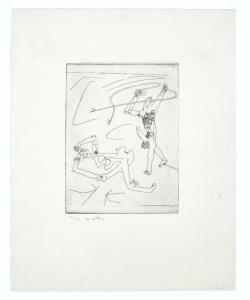 Executed in Paris in September 1939 Provenance M. Knoedler & Co, New York. B.C. Holland Gallery, Chicago. Acquis par la famille du propriétaire actuel en janvier 1965. 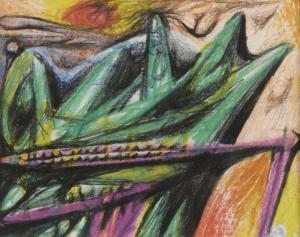 Roberto Matta (1911-2002) Chilean, PERSER L'INVISIBLE, 1996, color carborundum gravure, hand-colored with pastel and gouache on hand-made paper, signed in brush lower right and numbered 74/125 in pencil lower left, sheet 38 ½ x 38 ½\”, frame 48 ½ x 48 ½\”.ConditionIn apparently good condition.